I've got company today! A big thank you to Annie Davis who brought this to you and authored the article! Family vacations allow for family bonding and relaxation. Unforeseen occurrences, however, can turn your dream vacation into a nightmare. If you're planning a family vacation, here are seven tips to help protect your family while you're away. As you travel around, especially if you're going to a foreign country or a big city, avoid carrying around a large amount of cash. Wear a money belt underneath your clothes where you can stick your passport and some emergency cash in case your wallet is stolen. Bring only what you need on your trip, such as one or two major credit cards and a debit card. Leave your checkbook at home. While away, only visit ATMs during daylight hours, and cover up the key pad as you enter in your pin. When you're away from your hotel room, make sure any important documents and money are put into the room's safe. 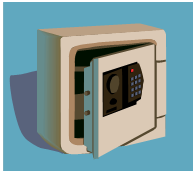 If a safe is not available, consider bringing along a portable safe that can be attached to something in the room, such as a bed post, and secured so it can't be removed from the room without a key. Does your health insurance cover you in the place where you're traveling? If not, you can find travel insurance that can cover any unexpected trips to the doctor. Travel insurance can also cover other surprises such as losing your bags, or having to cancel your trip at the last-minute. Many car rental companies encourage you to purchase insurance to cover the rental car, but many car insurance policies, may cover damage to rental cars, which will save you having to pay extra for insurance through the rental company. Be sure to check before you head out on your trip. A vacation with your kids is fun, but you have to be careful, especially if you're planning on going anywhere crowded like an amusement park. Plan ahead by getting a child locator, such as Mommy I'm Here. These locators are little bears that come with a key ring you can attach to your keys. Some come with an auto alert that will sound if your child is more than a few meters away. A device like this is particularly important when traveling abroad. After all, it’s the last thing you want to have happen during an incredible vacation in some wonderful Switzerland hotel, for example. Nobody wants to suddenly find themselves having to search frantically for their child. Another great option for crowded places is a safety tattoo. These are temporary tattoos that can be customized with your phone number so that if your child is lost, he or she doesn't have to remember your phone number and can just show the tattoo. They're sweat-proof and waterproof, and will last one to five days. Hotel room doors are a huge safety concern because they're designed to unlock when the handle is pulled from the inside, making it easy for kids to run off. You can get door anchors that are designed to prevent this and are installed and removed in just seconds. To open the door, the anchor must be rotated upward making it difficult for kids, especially toddlers, to open these doors. With a little extra planning, having a safe vacation with your family is easy. I had a little wanderer, but thankfully he was never able to get that far from me before I noticed that he had walked off. Great tips! Especially about using the safe in the hotel room for your important documents. Good idea. A great post! We don't travel a whole lot, but all of this is good to know. What Chatty Crone said. Great tips indeed. I have never heard of safety tatoos, but what a great idea. Great tips... I like the door anchor too. We have been doing staycations lately, but this is good to know in the event we do take a family trip out. Great tips. I agree that kids can wander off very easily, I love the idea of the safety tattoos for little ones! Every year, we go to Myrtle Beach for my husband's family vacation. This past year, his uncle almost totaled the rental car in a freak accident. Thank goodness for renter's insurance. It seems like a pointless added-on cost at the time, but I can definitely say we will always go for it after that experience! I never heard of travel insurance, but it makes perfect sense! The safety tattoos have been on my mind lately! Great idea. Anne has certainly shared very important tips Rosey! Take care and enjoy the rest of your day. WOW I really love that safety tattoo idea! Mine are all grown, but I will sure keep it in mind for future grandkids. These are great tips. The safety ideas are a good idea! I'll also have to look into door anchors. These are very important tips because predators deliberately prey on families that are on vacation and put a damper on their family time. The last two tips totally caught my attention! I have never heard of those before - thanks for sharing! These tips are great! I'm now faced with worrying about safety with my teens when they travel. My son is leaving for Germany next week and safety for teens is a whole different ballgame! That's totally useful, especially that I'm traveling abroad relatively often. I am a big believer in getting that insurance on a rental vehicle. We rented an RV and got into a little "accident" and their insurance company tried to rake us over the coals. If only we opted for the insurance....Very, very good tips here!! Good tips. Using the hotel safe is really a good one. My daughter learned that the hard way by leaving valuable jewelry in the room. Great tips especially the door anchors! Safety Tats are a great idea! We love them! Nice tips! Also, a leash is a good idea if traveling with kids in large public places. It helps me to keep my 2 kids nearby in airports during our trip from US to Philippines. I think everyone is so worried about getting somewhere on vacation that they often overlook ways they can protect their families. Great tips! I had not heard of safety tattoos. I need to look into these before our next trip. Those are some great tips, Rosey. Thank you so much for sharing! Those are great ideas! I never knew about the safety tatoos! That is brilliant. I need one of those for our next trip. These are very good tips for the family. I have wondered about a way to secure the doors in hotel rooms before too. Some very good advice in this post. Thank you. Great tips! I didn't know about the hotel room doors. Learned something new today! Great tips! Thank you. Definitely a lot of things to keep in mind. These are very good tips to remember when protecting your family on vacation. I like the tip about getting door anchors to keep the kids from taking off. And I always make sure to get insurance when renting a car! I have to say the neatest idea is the safety tattoos! I love that idea. I am a very cautious person so I did know most of the other tips but the tattoos that is really innovative. These are great tips. I especially love the idea of the phone number as a temp tattoo. Kids lose papers and stuff so this is great. I've never heard of safety tattoos before. That sounds like a really great idea. That would be perfect for me with 4 kids heading out. These are some really great tips. Thank you. What a great article and fantastic ideas. I just returned from vacation and was lucky to not have any issues. Still wish I would have read this before vacation! Excellent tips. I already use alot of these on your list, but there is always room for improvement! Great tips, I'm going to save these for later. Great post and very helpful especially in my case that I have two little kids. Very good post, and I appreciate the tips!! These were really awesome tips. Getting ready to go on vacation - these are some great tips - thanks. great tips. Love the idea of the safety tattoos. Thanks for sharing this and thank you Annie for writing down all of this great information!